There is a school of thought in the music industry that you should make studio albums that are radio-friendly versions of your songs, then go balls out during the live show. This approach yields some pretty damn boring studio music from bands with great live shows, resulting in disappointment as you slide into your CD player that new album you just bought from this exciting new band you�ve discovered. Happily, Aaron Beavers and his California-based band Shurman don�t subscribe to that school of thought. In fact, the thing that struck me most about Waiting For The Sunset the first time I listened to it, was the sheer raw energy coming through my speakers. I felt as if I was listening to a live recording. Beavers� voice is so powerfully unrestrained as he belts out rockers like �Best You Ever Had� and �She�s The One,� it seems that he could only have let himself go so far because he had to make himself heard over the other instruments. While doing research for this review, I discovered that the band�s last record, Jubilee, was recorded live in the studio. This album is not quite that raw, but suffice to say that these boys seem to get it. Musically, Waiting For The Sunset is primarily a rock record, but there are definite country overtones, including one full-on twanger, �Country Ain�t Country;� a sweet ballad, �Lonesome LA Blues,� that features some beautiful slidework by the great Al Perkins; and a pure countryrocker called �Three Chords� that closes out the record. Plus, leadsinger/songwriter Beavers was raised in Texas and Georgia, so his voice has a definite country bias. She was lit up like Times Square New Year�s Eve. Rolling down the avenue, crashing in the street. Trying to be a model/actress working in a restaurant. If the cocaine don�t kill �er, the pills prob�ly will. Never seem to have a problem getting them prescriptions filled. And there�s a yellow one that brings you back around. It�s all part of a small town tragedy. This is life at its grittiest and Beavers seems to have observed it pretty closely. The inequities of an unnecessary war have been the subject of songs by many artists recently, including James McMurtry and Reckless Kelly, and, now, Shurman. While McMurtry tends to be more political in his approach, Reckless and Shurman focus more on how the war directly affects the men and women of our armed forces who are coming back with their bodies destroyed, if they were lucky enough to survive the experience. And, yes, that approach is the true embodiment of �political,� which originates from the Greek word for �citizen.� How is this war affecting the country�s citizens? Beavers attempts to answer that question. In �Here�s To Rock N Roll� he tells the first-person story of one of the men who was killed in the war. My best friend took one yesterday, he�s on a plane to Germany. He�s going home with just one eye. My wife was a blushing bride, but widows don�t look good in white. Tell my boy I had pride. If you don�t stand for something you can fall for anything. Now you�re left with nothing 'cept your Army green. A wailing guitar follows Beavers� scream-singing of the chorus, producing, without a doubt, one of the most powerful musical moments of this year. Let me quickly clarify �scream-singing,� because I don�t want you to get the idea that all Beavers does is vocally assault the microphone. The fact is simply that he is not afraid to get very loud to emphasize an emotion, to drive home a point. I only comment on it, because it seems to me that singing inside a studio often causes vocalists to hold back, even when the performance requires much more. 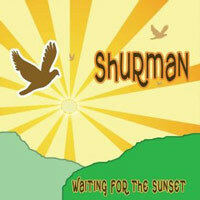 Shurman�s Waiting For The Sunset — is the title a nod to The Doors� Waiting For The Sun, which also included an antiwar anthem, as well as some classic scream-singing from Jim Morrison? — was produced by Danny White at 16 Ton Studios in Nashville and is one of the year�s best records. It rockets out the gate, finishes with a bang, and fills in the middle not with a creamy nougat (welcome to mixed metaphor hell), but with hard-edged country rock and nods to traditional country along the way. With Waiting For The Sunset Shurman has captured energy in the studio that most bands will never achieve live on stage, but this is not just a goodtime band; songwriter Aaron Beavers has something to say. So, sure, have a beer or two, along with a Jägerbomb, maybe the occasional shot of Patrón, but, please, listen to the message behind the music and try thinking, just for a few moments, with that thing you have just below your hat. Only then will you truly appreciate Aaron Beavers and Shurman.